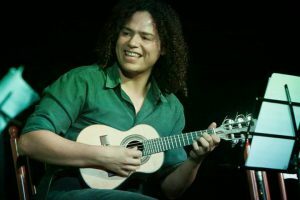 Born in Brasília in 1984, Márcio Marinho began to study cavaquinho at age 13 with his uncle Ricardo Farias. By 15 he was a soloist for “Tio Brito’s” group, “Os Novos Chorões.” He has since performed in many and diverse ensembles including our guests, “Choro Livre,” which he joined in 2004 at the invitation of Reco do Bandolim. An inventive accompanist and soloist, Márcio plays not only the traditional 4-string cavaquinho, but the 5 and 6-string varieties as well. He has extensive teaching experience, including many years on staff at the Escola de Choro Raphael Rabello in Brasilia. Copyright © 2018 Choro Camp — New England. All rights reserved.